I went grocery shopping a few weeks ago and I had found boneless pork shoulder roast on sale. Well, I thought, wouldn’t this be a nice break from chicken or beef one day. Into the deep freeze it went! Today, seemed like a perfect day. I woke up this morning to many Facebook messages of “It’s SNOWING!” or “Flurries!!! !” Oh boy. I looked outside and I occasionally saw a few flakes. I love snow….within reason. At least we didn’t get our first blizzard of the season yet. Anyway, I had a few days of really full cooking days, so I wanted something simple. 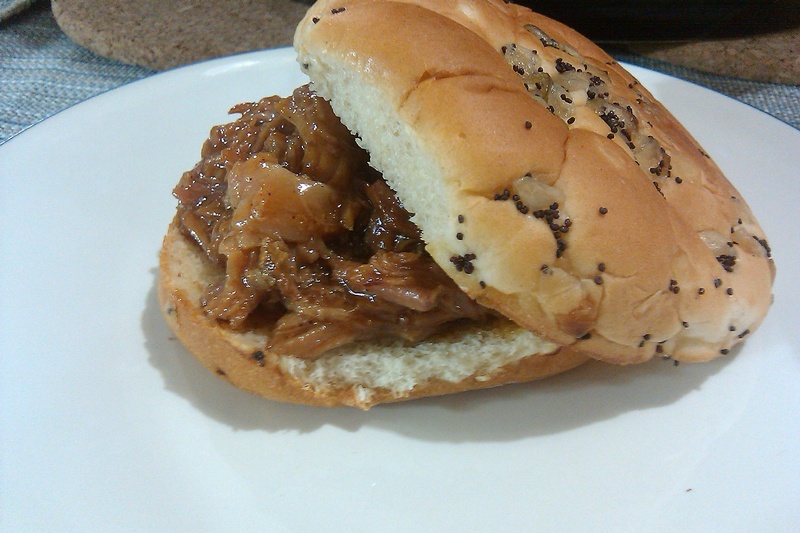 BBQ Pulled Pork Sandwiches sounded like just the easy dish to make. I pulled down my crockpot and set to work . The best part, I started this dish with a completely frozen pork roast. No defrosting necessary! I have a 6 Qt crockpot, but a smaller 4 Qt crockpot will be just fine for this recipe. After about 5 hours, shred your roast and add the BBQ sauce. Now I’m hungry.I usually used soy sauce and condensed mild and a little catchup to be able to make it thicker.You’ll love it,it’s sweet and salty.You can add peppers if you wanted to.Very good for this kind of dish you posted. That sounds like a nice combo 🙂 Thank you for visiting! Very nice. I love your choice of rolls. These were an AWESOME Jewish-holiday treat!